- One of my favorite things to do is to break out the map, look at trails, put together a long strenuous hike, and run it by my dad until I get following response, "Don't be an idiot." Once I hear the word idiot, I know I've found the hike to do! - Saturday's forecast was calling for "Spectacular views, with a chance of afternoon spectacular views." Perfect for a little hike up Huntington Ravine, followed by dropping down into the Great Gulf, shooting up the steepest (abandoned) trail in the Whites, the Adams Slide Trail, and then top it all off by heading down the Sphinx Trail to do some light trail work. - I left RI around 2:30 a.m. and made to Pinkham Notch Visitor Center and hit the trail at 6:30 a.m.. All was quiet at PNVC and there wasn't another person on the Tuckerman Ravine Trail as I headed to the Huntington Ravine junction. In just a few hours this trail would become 'The Express Way' to Mount Washington with hundreds of hikers of all different ages and experiences hiking up the rock pile. But before 7 a.m. it was a ghost town, or path if you will! - Once on the Huntington Ravine Trail I made good time to the floor of the ravine. I passed a hiker at the Cutler River crossing, he was thrilled about the day ahead with the excellent weather forecasted. - Once I hit the floor of the ravine I made my way through the twists and turns of the big boulders that sit like an obstacle field along the trail below the Fan. - As I hit 'The Fan', which is the huge field of boulders that sits below Central Gully and the rock scramble to the right of the gully, a huge smile came to my face as from here until gaining the ridge the trail becomes steeper and the views become more rewarding. - I made my way across the Fan, hurried up the overgrown trail that leads to the bottom of the first scramble, and then attacked the steepest trail in the Whites with almost no issues at all. With all the rain this summer, there is a little slime that covers parts of the first scramble making it a little trickier than usual. Luckily, I have been up here enough to know to take it slow and just make sure I have proper footing and a good hand hold to make it up safely. - From here the scrambles get easier and the views keep getting bigger. Along the way I ran into two guys relaxing and taking in the views just below the 'Chimney.' I talked with them for a few minutes as they were out hiking early to beet the crowds up and down Washington. - I then made my way up to the top of the ravine and eventually hooked onto the Nelson Crag Trail which heads over a few bumps near the auto road until crossing the tracks and reaching the summit. I hadn't been on this section of the Nelson Crag Trail in a couple of years so it was nice to be back on it again. - At the summit I headed up to the deck of the observation tower and stayed up there for about fifteen minutes and watched the old Coal run Cog train slowly chug up the tracks to the summit. I ran into Adam Clark, who was taking a bunch of pictures himself (Click here for his image galleries). We chatted it up as the Cog made it's way in front of us with the Northern Presidential Range behind it. Adam is the cook at the observatory who makes the yummy dinner for the workers and volunteers. Great to see you Adam! - I then headed off to start part two of my hike, dropping down into the Great Gulf, via the Great Gulf Trail. The Great Gulf is probably the roughest, wildest, and wettest place in the White Mountains. It's has a rugged, secluded beauty with extremely steep approaches down to the bottom from any trail between Washington to Madison. - The Great Gulf Trail shoots down the headwall, first over loose boulders, then, it hits a slide from Hurricane Irene and heads over even looser boulders! Once past this section you hit the river section of the trail, it's still steep, the loose boulders have been replaced by ancient boulders which haven't moved in thousands of years. These boulders are covered with moss and green slime, the trail becomes a running river with mini waterfalls, I was soaked and loving it! My pace was slow but I could care less as I just kept shaking my head in awe of this trail and how much water was gushing from it. I've hiked up the headwall twice and it was wet but never like this! The volume of water was impressive and the hiking was tricky but I finally made it down to Spaulding Lake and took a nice little break. - From Spaulding Lake the Great Gulf Trail meanders by the West Branch by Weetamoo Falls and Cascades. Parts of the trail are flooded, the river crossings have changed a little since Hurricane Irene and tropical storm 'Sandy Pants' came through. They seem a little washed out at the banks than in the past and was happy not to lose the trail at the crossings. - Near the site of the former Great Gulf shelter and lean-to I ran into the first hikers since being on the summit of Washington. It was a couple who were going to set up camp and then go hike up the Sphinx and down the Great Gulf headwall. - From here I headed to the Six Husbands Trail were I ran into Mike Cherim, who was leading an A.M.C. group up the Six Husbands Trail and down the mighty Sphinx Trail. (click here for his pics). I hiked with Mike and his group before banging a right on the Buttress Trail and soon started up the abandoned Adams Slide Trail; part three of my hike. - The Adams Slide Trail heads right up into the woods where the Buttress Trail takes a right across a talus field. It is very steep but fully overgrown, there are no views from the moss, dirt, rocky, grown in slide below treeline. From time to time you run across a red blaze on a rock. The trek up the slide is interesting, I stayed on the trail the whole way but I had been on it before so that helped. Also, I read a bunch of reports years ago before the first time I attempted it. I would say it's difficult to follow at times and stay on the trail proper, it gets really thick in spots, too. However, there are other sections where it's easy to follow an not as thick. I made a big mistake and wore shorts and a cut-off t-shirt. I got scraped up and down my legs and arms. Worst thing was a kamikaze tree branch dove into my leg creating a gash that bleed a little! - The Adams Slide Trail eventually just pops out of a small hole in the forest up a rock to treeline. From here there is scrub all around you. If you look closely you can still follow the trail. you will know your on it only because as your going through the scrub there is dirt or rocks under your feet not branches or other delicate alpine vegetation. I knew I was still on the trail because I'd see a rock under the branches with some red paint on it. Finally, like most trails above treeline the trail becomes a boulder field with cairns. 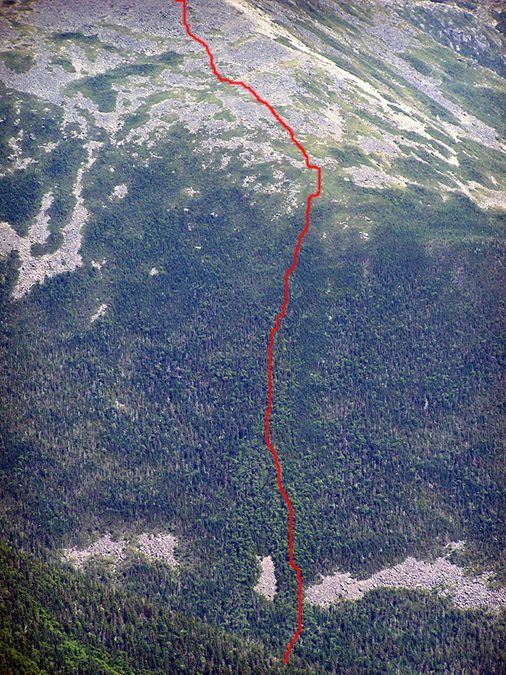 Last time I hiked the Adams Slide Trail the above treeline section had cairns topped with white quartz rock almost all the way to the Star Lake Trail just below the summit of Mount Adams. This time there were fewer cairns and they were not as prominent but with the great weather there was no issue hiking up to the summit. Plus even if there were no cairns all you do is keep heading up on a day like this! In low visibility this would be hellish! - Views while heading up the eastern slopes of Mount Adams are phenomenal. The Great Gulf is below you and you get a really unique view of Jefferson Ravine. I was cut up and bleeding from the below treeline section of hiking but it was well worth it for the above treeline section! - The summit was swarming with nasty bugs so I snapped a quick pic and headed south to Mount Jefferson. I was back on familiar trails and made my way to Edmands Col, passing by some thru-hikers who I told to enjoy Maine! - When I hit the summit of Mount Jefferson I looked around to see if Mike and his group was there but they weren't so I took a short break before heading to the Sphinx Col for part four of my hike; Sphinx trail work. As I dropped down the Sphinx Trail I ran into the nice couple I saw earlier in the day who were spending the night at the site of the old shelter and lean-to! - What I wanted to do was focus on the cairns above treeline. Luckily most were in ok shape so I just maintained them. I have to come back to look for rocks to build them up a bit for winter hikers but for the summer they are ok for now. Below treeline the trail needs some trimming back and that's what I'll do next time. Above the cascade/water section there is a crossing that could be confusing when descending so I built a small cairn to help hikers navigate. Unfortunately, as I was building it I lost my footing in the water and fell down bashing my finger with a big rock. It hurt like hell and I was seven miles from my car so it was time to book it out of there. Luckily, most of my way back to my car had water so I was able to keep the swelling down by just sticking my hand in the water every chance I got. I got lucky and didn't break it which I credit to all the milk I drink, it does a body good! - To get back to my car I had to head back along the Great Gulf Trail, hook onto the Madison Gulf Trail, cross the Auto Road to Old Jackson Road which ends at PNVC. I made it back to my car with no other issues, the finger was numb but fine, the gash on my leg felt ok. However, over the night it swelled up filled with fluid and got infected a little bit. It's recovering as I write this so it was well worth it!....Actually, a month later a piece of wood would end up oozing out of my leg, it was pretty cool but really sketchy. I had no idea why the swelling wouldn't go all the way down, it finally did after the wood came out!! - All I have to say is, the Great Gulf is GREAT, so check it out, it's well worth it! Huntington Ravine Trail, the floor of the ravine. Notice the new growth pine trees lining the trail! Huntington Ravine Trail, it winds through car and house sized boulders in the woods below the fan. Huntington Ravine Trail after the fan heading to the first scramble, notice how overgrown this section is. Bottom of first scramble. There's a yellow blaze and a white arrow in the pic. Lizzie Bourne Memorial, she was the first documented case of someone dying on the mountain. She was a teenager, they ran into cold weather and bad visibility and could not find the summit which was just a couple hundred feet away. The group laid down for the night in the elements but she did not make it and succumbed to hypothermia. The Great Gulf Trail, as landslide came in from the left and whipped out the old trail which looks the same as the new one because it's still loose boulders! Flooded Great Gulf Trail. This was always wet but no it's a moving stream. There's not much that can be done to fix this. The Great Gulf Trail, it's dry in a few spots! Flooded Great Gulf Trail. Another section that is a moving stream now. Flooded Great Gulf Trail. Just between the old shelter site and the Six Husbands Trail Junction. This is a complete mess of shallow water with nasty mud underneath. Bog bridges would fix this in an instant. Adams Slide Trail, heads over small boulders in the woods. Adams Slide Trail. As you can see moss has overtaken the rocks. Dirt and debris has covered most of the slide which is buried beneath feet of this stuff. Adams Slide Trail. Slide visible in this pic. A very old blaze can be found if you push the branches back when you stumbled over a rock you can't see while heading through the thick scrub. Adams Slide Trail, one of the few white quartz cains left. Entering the Great Gulf Wilderness, again! Sphinx Trail, notice the blue blaze. One of only two left on the trail. No longer to be blazed because it's a Wilderness area. Just below where I bashed my finger! Wow, nice loop! I hiked Huntington's (finally!) the same day you did, just later in the morning. Huntington's was so much fun, I'll certainly be back to do it again! Hope the hand and leg heal up quickly. Thanks Summerset! Your trip report and pics were great, too! Hand and leg are good to go, thanks for asking. Have a great summer hiking! Your trip reports and pictures are the absolute best on the web for the whites. The pictures especially. Really get a great sense of the trail from your pics. Thanks for all the great work! Thanks for the link post to my photos Chris. It was good chatting with you. And as I said, I always enjoy seeing your reports and pictures. Hi Adam, it was nice running into you. You take really great photos. I'll keep my eye out for you next time I'm on the rock pile! Sources say Adams Slide Tr was closed in 1971. I'm amazed that the lower portions have grown in to the extent they have, over the slide. Great report - you are brave! Also, did you ever find where this trail started at Six Husbands? Hi Julie, thanks for the info on the Adams Slide. I always wondered what year they officially closed it.As far as where the trail started off the Six Husbands, I believe the first tenth of a mile of the Buttress Trail before it takes the sharp right across the talus field was actually the start of the Adams Slide Trail and the Buttress started at the Talus field. Then when they closed the Adams Slide Trail that first tenth of a mile became the beginning of the Buttress. I could be wrong but it makes the most sense. I am glad you like the report and pics, thanks!